Although the Chippewa County Relay for Life official event is July 30th & 31st this year, Spectrum Industries Inc. continues its fundraising efforts during the entire year. Led by Teresa Repaal, cancer support is given throughout the company with seasonal sales of Main St. Café pies and That’s My Pan items, as well as the ongoing sales of muffins and candy bars. Enthusiastic support is also shown at company-wide cookouts, where employees donate food, time, and money – all to help those diagnosed with cancer to fight and win their battles! 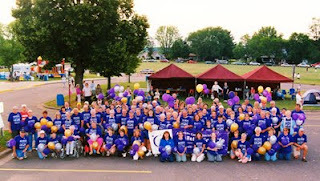 Spectrum placed 3rd of 33 teams in raising $110,000 for the 2009 Relay for Life’s walk for cancer, raising $5,269. Their tremendous effort carries on this year under the theme of “Celebrating More Birthdays”. The July 30th & 31st birthday party agenda includes games all night, inflatable rides, presents, cakes, silent auction, food, camping & DJ/music. “Celebrating More Birthdays” means there are more cancer survivors fighting & winning every year. Cancer survivors are the heart & soul of the Relay, and Spectrum will celebrate their achievements while raising money for cancer research to help those in the future. To remember loved ones lost, nothing is more touching than to experience the laps walked in silence during the Luminaria Ceremony, where candles are lit inside personalized bags lining the track. We would like to thank the American Cancer Society and the Chippewa County Relay for Life for helping to make this event increasingly successful. Spectrum Industries will gladly do our part to offer continuing support to our community.